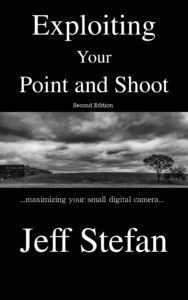 Jeff is the author of several popular photography paperbacks and Kindle eBooks, all available on Amazon. This, our most popular book, introduces photographers to the wonderful world of medium format film photography. 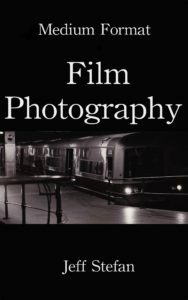 It teaches how to select and use a medium format film camera, how to develop negatives and create digital images from the negatives. 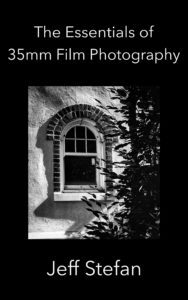 Medium Format Film Photography is also available in paperback. Do you love photography? Are you interested in expanding your knowledge and skill by diving into the world of film photography but don't know where to start? This book is for you. Urban environments constantly change- people, attitudes, fashions, buildings, storefronts, you name it. It’s always dynamic, which is one of the great enticements of urban photography. There is always something unusual and interesting to photograph in the most obscure nooks and crannies of a city or town, if you take the time to look. 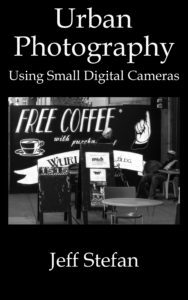 Urban Photography Using Small Digital Cameras shows you how, using simple point-and-shoot cameras. Pure street photography is all about timing and capturing people in moments that will never exist again. Urban photography is wider in scope, where you still have the spontaneity of shooting people on the street, but you can take a little more time looking for and composing environmental and cultural shots. Both are certainly not leisurely activities- you have to be ready to instantaneously shoot whatever is revealed to you at any moment. By practicing the methods provided in Urban Photography Using Small Digital Cameras you can become a quality urban photographer creating awesome images. I’m a dyed-in-the-wool DSLR (Digital Single Lens Reflex) and film photographer, but I finding myself more and more attracted to the simplicity and street photography convenience of digital point-and-shoot cameras. Point-and-shoots are not simple “birthday party” cameras (although I’ve used them for such). They are remarkably capable light processing machines. Point and shoot features coupled with their small footprint make them an excellent choice for tons of shooting situations. You can do a lot with a point-and-shoot. For example, how is it that some people can take a cheap pencil and copy paper and produce striking and substantial art? Simple: a little talent and lot of practice. The same goes for taking photographs. Here’s a secret- the more you practice, the more talented you become. By following a few basic rules and using some relatively inexpensive or free tools, you can dramatically improve your photographs and create art. 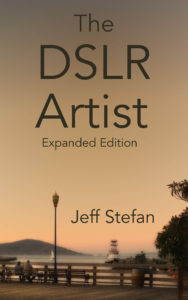 If you're new to the DSLR world, this book may be for you. No one can make you an artist- that comes from within and takes dedication and practice. Armed with your DSLR, this book may help you become one by showing you how to use your DSLR, what to look for before you buy one and how to compose killer shots by following a few guidelines.